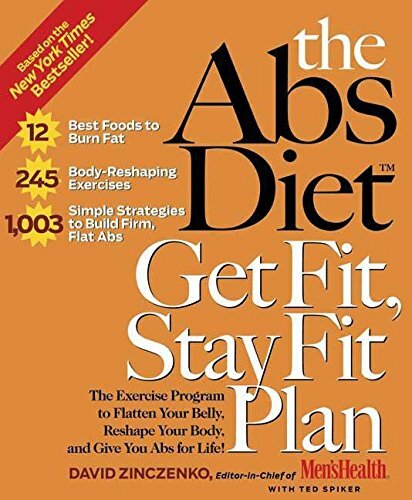 The Abs Diet Get Fit, Stay Fit Plan: The Exercise Program to Flatten Your Belly, Reshape Your Body, And Give You Abs for Life! Amazon.com description: Product Description: Tens of thousands of Americans have changed their bodies - and their lives - with the help of The Abs Diet, the New York Times bestseller from David Zinczenko, editor-in-chief of Men's Health magazine. Now, to meet the demand for more information about exercise, Zinczenko and coauthor Ted Spiker present readers with dozens of workouts and hundreds of exercises that they can do any time and any place for fabulous body-altering results. In The Abs Diet Get Fit Stay Fit Plan, workouts are flexible, varied, and quick - you can complete them in less than 20 minutes. Designed to strengthen your core, flatten your gut, and get you in the best shape of your life, this exercise guide demonstrates why David R. Pearson, director of the strength-research laboratory at Ball State University, has called the Abs Diet program "a must for anyone who is serious about building a healthy body." About: Shares exercise options for increasing metabolism, burning fat, and building muscle, in a workout reference that focuses on abdominal and large-muscle groups and outlines a thrice-weekly speed-interval routine for faster results.